The joy of finding that unique and unexpected treasure amidst a sea of vintage collectibles makes shoppers’ hearts beat a little faster. And, with so many antique malls and flea markets in the Kansas City metro area to choose from, the thrill of the hunt never ends. This Granddaddy of all antique stores is a four-story, 30,000-square foot behemoth, crammed to the gills with heirlooms and artifacts. Whatever you happen to be looking for—be it a sterling silver toothpick dispenser or a ceramic thimble hand-painted with the likeness of Mount Rushmore—you’re sure to find it here. Located in the historic River Market district of Kansas City and home to more than 175 dealers, River Market Antiques is a packrat’s paradise. Their slogan is “Unlimited Variety of Merchandise,” and this two-story emporium in Parkville, brimming with jewelry, tools, candles, books, toys, linens, postcards, Christmas decorations and whatnots, delivers the goods. Their sister shop, La Bottega, features original art by local artist Cathy Kline, as well as paintings from El Salvador. This former 1885 schoolhouse in the Crossroads District, beautifully restored into five regal rooms, is overflowing with unusual and decorative accessories and gifts, including 18th and 19th century European antiques. Dining at the upscale (yet affordable) restaurant upstairs completes your fabulous girlfriend getaway experience! You know you’ve hit the motherload when you happen across this eclectic collection of shops in Kansas City’s Antique District, including Show Me Antiques & Consignment Shop, Kincaid Antiques, The Georgian Village, Parrin & Co. and the Knotty Rug Company. From Chinese antique furniture to old religious statues, this little stretch of street is chock-full of interesting discoveries. Although it’s 514 miles from Churchill Downs in Louisville, this 350-dealer, 50,000 square foot mall in Prairie Village is located in the former stable of the 1938 Kentucky Derby winner. Shop ‘til you drop, then refuel at the Mall’s trendy Bloomsbury Bistro. Recycling has never been so stylish. Although most shops are only open the First Friday weekend of every month, the West Bottoms area is rapidly becoming a prime destination for bargain hunters searching for one-of-a-kind knickknacks and trinkets. 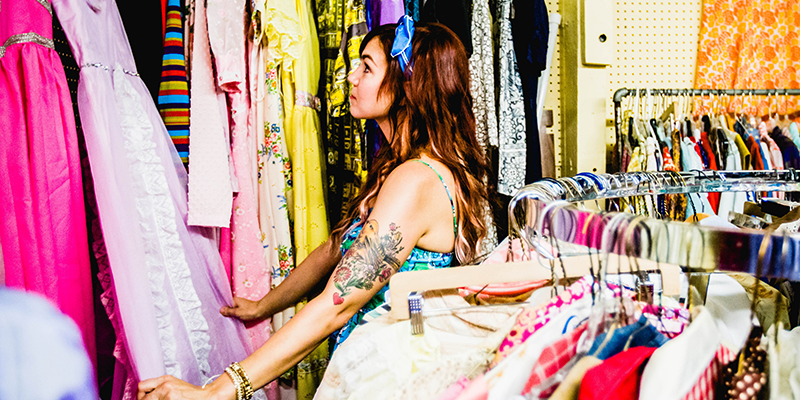 Liberty Belle, Good Juju, Bottoms Up Antique Market, Nook and Cranny, Bella Patina , and Stuffology are just some of the markets lining “KC’s Vintage Strip". From fossils and old science test tubes to vintage fabrics and games, you’ll be hit with sensory overload. For more than twenty years, Larry and Gwen Billings have kept this two-story gem on Massachusetts Street in Lawrence, Kansas, filled with Christmas tins, pink flamingoes and retro baby carriages, among other goodies. Digging for treasures amidst all these beautiful temptations is more fun than you could ever imagine.